BSPHCL JLM SBO jobs is 08-10-2018 via the official website of www.bsphcl.bih.nic.in. Candidates will be shortlisted based on written exam only for this BSPHCL SBO and Junior Lineman Jobs. Written Exam will be conducted for 100 marks. BSPHCL SBO, Junior Lineman posts exam will be held in last week of October 2018. Candidates who qualified Matriculation with ITI in Electrical trade they can apply for this Switch Board Operator and Junior Lineman vacancies. 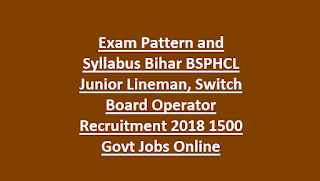 BSPHCL Junior Lineman Exam Pattern and Syllabus, Switch Board Operator Exam Syllabus, exam date, admit card details are given below. There are total 1500 Posts in this BSPHCL Junior Lineman, SBO jobs recruitment. As on 01-08-2018 age limits are 18-37 years for this BSPHCL SBO and Junior Lineman Posts. For General Female 3 years, EBC, BC candidates 3 years and for SC/ST 5 years of upper age relaxation is applicable. Matriculation and ITI in Electrician or Electrical trade qualified candidates are eligible to apply for this BSPHCL vacancies. Pay Scale : Rs.9200/- to Rs.15500 for both the posts. Application fee is Rs.1000/- for unreserved and EBC/BC candidates. Candidates selection for this BSPHCL Recruitment of Junior Lineman and Switch Board Operator jobs will be based on written exam marks merit only. 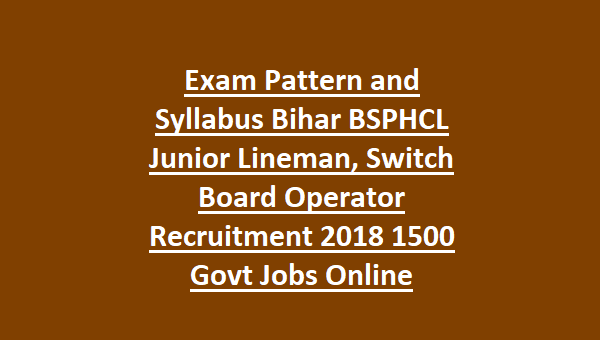 Written Exam will be conducted for 100 Marks for this BSPHCL Junior Lineman and Switch Board Operator Posts. Apply online for this Bihar BSPHCL recruitment of SBO and Junior Lineman posts before the closing date of 08-10-2018. Official website to apply online is http://bsphcl.bih.nic.in/. Exam Date, Exam admit card, exam pattern and syllabus and other details are available in this website only.